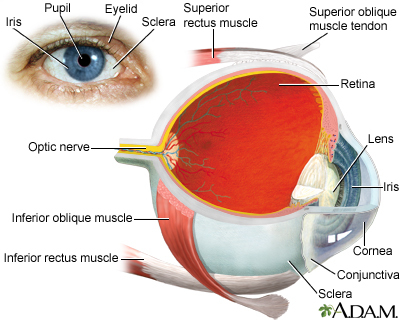 The conjunctiva is a clear layer of tissue lining the eyelids and covering the white of the eye. Conjunctivitis occurs when the conjunctiva becomes swollen or inflamed. This swelling can be due to an infection, an irritant, dry eyes, or an allergy. Tears most often protect the eyes by washing away the germs and irritants. Tears contain proteins and antibodies that kill germs. If your eyes are dry, germs and irritants are more likely to cause problems. Conjunctivitis is most often caused by germs such as viruses and bacteria. "Pink eye" most often refers to a highly contagious viral infection that spreads easily among children. In newborns, an eye infection may be caused by bacteria in the birth canal. This must be treated at once to preserve eyesight. Allergic conjunctivitis occurs when the conjunctiva becomes inflamed due to a reaction to pollen, dander, mold, or other allergy-causing substances. A type of long-term allergic conjunctivitis may occur in people who have those with chronic allergies or asthma. This condition is called vernal conjunctivitis. It is most commonly occurs in young men and boys in the spring and summer months. A similar condition can occur in long-time contact lens wearers. It may make it difficult to continue to wear contact lenses. Over-use of contact lenses (often extended-wear lenses) can lead to conjunctivitus. Eye burning with discharge is burning, itching, or drainage from the eye of any substance other than tears. There are tests that can sometimes be done in the office to look for a specific type of virus as the cause. Treatment of conjunctivitis depends on the cause. Allergic conjunctivitis may improve when allergies are treated. It may go away on its own when you avoid your allergy triggers. Cool compresses may help soothe allergic conjunctivitis. Eye drops in the form of antihistamines for the eye or drops containing steroids, may be necessary in more severe cases. Antibiotic medicines work well to treat conjunctivitis caused by bacteria. These are most often given in the form of eye drops. Viral conjunctivitis will go away on its own without antibiotics. Mild steroid eye drops may help ease discomfort. If your eyes are dry, if may help to use artificial tears in conjunction with any other drops you may be using. Crustiness of the eyelids can be helped by applying warm compresses. Gently press clean cloth soaked in warm water to your closed eyes. DO NOT smoke and avoid secondhand smoke, direct wind, and air conditioning. Use a humidifier, such as in the winter. Limit medicines that may dry you out and worsen your symptoms. The outcome for bacterial infections is most often good with early antibiotic treatment. Pinkeye (viral conjunctivitis) can easily spread through entire households or classrooms. Your symptoms last longer than 3 or 4 days. You have a headache in addition to your other symptom. DO NOT share eye makeup and replace it regularly. DO NOT share towels or handkerchiefs. Handle and clean contact lenses properly. Keep hands away from the eye. Barnes SD, Kumar NM, Pavan-Langston D, Azar DT. Microbial conjunctivitis. In: Bennett JE, Dolin R, Blaser MJ, eds. Mandell, Douglas, and Bennett's Principles and Practice of Infectious Diseases, Updated Edition. 8th ed. Philadelphia, PA: Elsevier Saunders; 2015:chap 114. Centers for Disease Control and Prevention website. Conjunctivitis (pink eye): prevention. www.cdc.gov/conjunctivitis/about/prevention.html. Updated October 7, 2017. Accessed September 4, 2018. Holtz KK, Townsend KR, Furst JW, et al. An assessment of the adenoplus point-of-care test for diagnosing adenoviral conjunctivitis and its effect on antibiotic stewardship. Mayo Clinic Proceedings: Innovations, Quality & Outcome. 2017;1(2): 170-175. mcpiqojournal.org/article/S2542-4548(17)30031-0/abstract. Accessed September 4, 2018. Rubenstein JB, Spektor T. Conjunctivitis: infectious and noninfectious. In: Yanoff M, Duker JS, eds. Ophthalmology. 4th ed. Philadelphia, PA: Elsevier; 2019:chap 4.6.